Located in Ho Chi Minh City, the four-storey family residence is 21 metres deep but just four metres wide, typical of the tube houses that are common throughout Vietnam’s cities. These proportions make it difficult to bring natural light and ventilation through the buildings, which have no side windows, so Sanuki + Nishizawa introduced light wells, exposed staircases and flexible partitions to the interior spaces of ANH House. “The main theme of this house is to explore the possibility of a new lifestyle in Vietnam, in which such dark and humid spaces can be improved drastically into bright and open ones,” said the architects. The ground floor features a double-height living room sandwiched between a pair of open-tread staircases, creating a well-lit family area with a raised dining room and kitchen at one end. 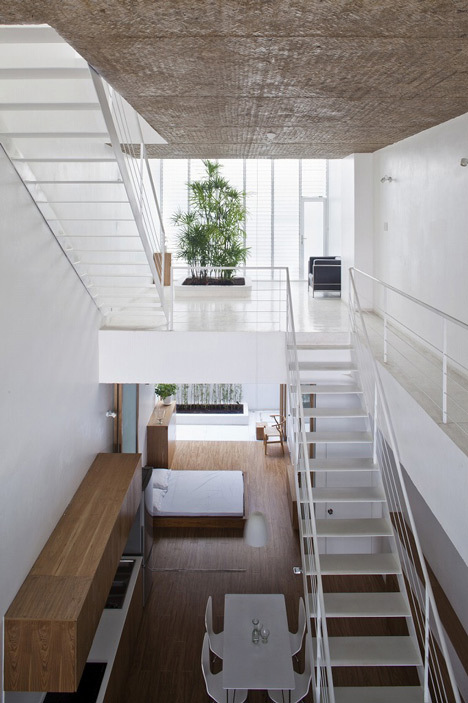 Woven bamboo screens enclose bedrooms on all four floors and can be folded back when necessary. The texture of this wood is echoed in the surface of the concrete floor plates, which were set against bamboo from work. Large planters allow spaces for tropical plants throughout the house, including on the three balconies that front the street-facing elevation. Meanwhile, some of the light wells double up as cooling pools of water. “We can feel the natural wind and live comfortably without air conditioning in this house, which [offers] a lifestyle connecting to the outside natural environment,” said Sanuki + Nishizawa. Sanuki + Nishizawa previously collaborated with Vo Trong Nghia Architects on a house with half of its floors screened behind hollow concrete blocks and the other half exposed to the elements. 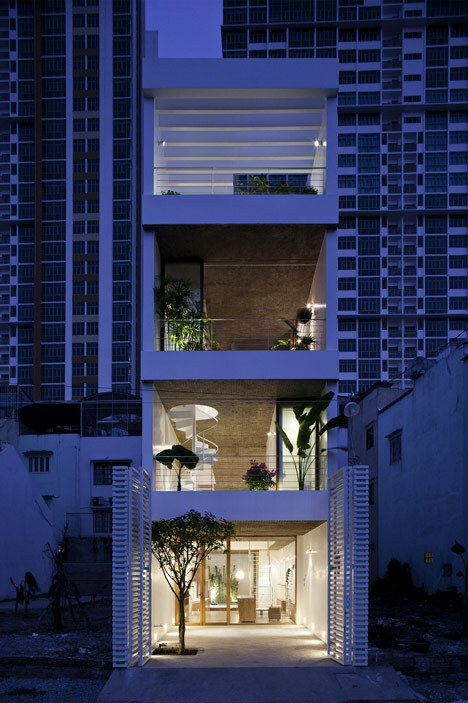 Other modern takes on the Vietnamese tube house include a renovated home with a narrow atrium in Hanoi and a residence with a vertical garden on its facade. 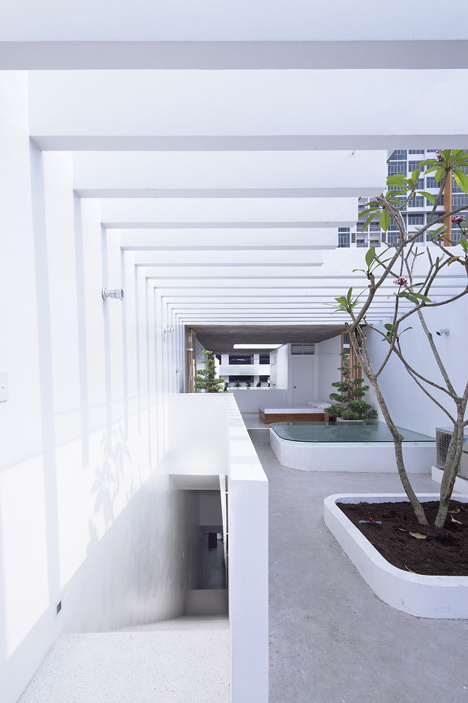 This house, designed for a thirty-year-old-women and her family, is built on the plot of 4m wide and 21m deep in Ho Chi Minh City, which is very typical for urban tube houses in Vietnam. The main request from the client was to realise a bright and open space filled with natural light and greenery. Tube house, the most typical housing style in Vietnam, itself has a critical difficulty in getting enough natural light and ventilation firstly because there’s no opening on the two long boundary sidewalls and secondly because Vietnamese people tend to have lots of fixed partition walls for separating many bedrooms. Therefore, the main theme of this house is to explore the possibility of a new lifestyle in Vietnam, in which that such dark and humid space need to be improved drastically into a bright and open one. The house is designed with 4 solid thick slabs and no normal fixed partition walls. Each slab, stuck in the different height, has several voids that lead natural reflection light from the top-light, façade and backside into the house. In addition, each slab is set out with several holes of terrazzo bath-tub and foot-space for sitting, especially the 15 holes for greenery with different kinds of tropical plants to make the space attractive and fresh. Furthermore normal familiar fixed partition walls are replaced into light, movable and translucent partitions for separating bed spaces, adjusting balance between the privacy for each individual space and the fluency of whole big space according to the lifestyle’s request. These partitions are the folding or sliding doors with woven bamboo as a shade and jalousie windows system which are easily opened for the natural wind circulation to go through the whole house spaces. 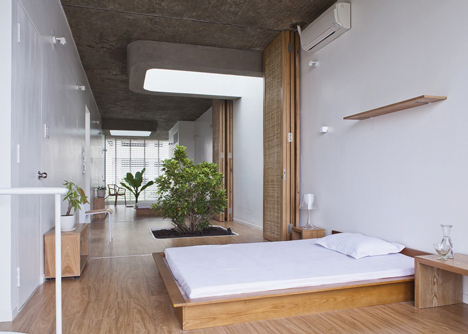 Briefly, all of design intents are to fulfil the tube house spaces with greenery, brightness, well-ventilations then transform the narrow, dark, humid passive residential housing into “the space connecting to the outside natural environment” – where the people can feel real outside atmosphere. The house structure is a RC frame structure with reversal beams system. Besides, using the woven bamboo sheet as concrete work’s frames for engraving the bamboo pattern on the exposed concrete ceiling, not only emphasises the continuous slab and natural lighting effect, but also creates stronger aesthetic effect together with real woven bamboo of doors system. All these materials and techniques adopted into this house design are local and widely common in Vietnam. We can feel the natural wind and live without air conditioner comfortably in this house that has the “lifestyle connecting to the outside natural environment”. Somehow, this sustainable and ecological proposal is considered as a re-definition of the Vietnamese traditional lifestyle connecting to the outside environment in the contemporary housing. We really hope this simple, bright and open lifestyle can be one of the effective alternatives in the modern lifestyle in Vietnam. ← Previous Story Vietnam: Is There a Future for the Green Building Industry?